For Amelia Spelled, it's a case of déjà brew when a man dies at a Tea Leaf Reading. Amelia and Camino are among the witnesses. Only trouble is, they were both asleep at the time. Luckily, Amelia is soon brewing up a solution, along with her trusty friends, who are out to prove there is a tea in team. Can't ever go wrong with a book by Morgana Best! 5.0 out of 5 starsFun, fun, fun! Amelia has no problem getting herself into another mystery of a murder. With the help of course from her friends she figures out the whole story of how, who and why. That's always when the person confronts Amelia at the house and her grandmother helps capture the person. The end of this story was very romantic you'll just have to read it yourself. Amelia goes to a tea leaf reading where several people are also there. During the reading, she is knocked out and one of the attendees is murdered. As usual, Amelia is suspected and she has to find the culprit. Some twists, but the murder is solved and things are about to change for Amelia at the end. Amelia and Camino go to the Tea Leaf Reading and a man dies. Isn’t this what all the stories are about, but as usual it is fun to see the (Grandmother) house and (Grandfather) in the garden and what’s up with Adler Vervain? Good story and can’t wait for the next book. 5.0 out of 5 starsA favorite cozy. 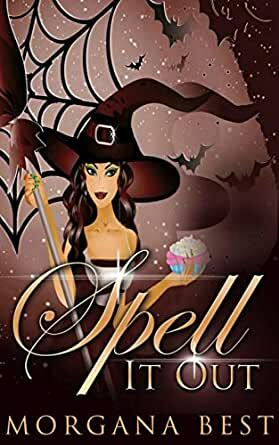 The Kitchen Witch series is a favorite of mine. There's always mystery, fun and cupcakes. Amelia and Camino attend a tea reading session only to become involved in a murder. This mystery isn't hard to solve but there's a surprise at the end. There is a murder, of course, it's a murder mystery series but no objectionable language.